You are here > Home>Case Studies>Tuffa De-Icer Tanks help keep Manchester Airport Flying! 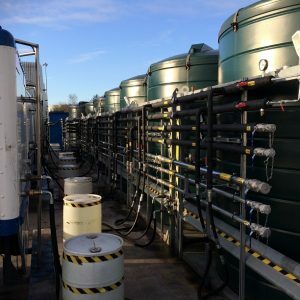 Tuffa De-Icer Tanks have been used as part of a new de-icing fluid storage and processing system set up at Manchester Airport for Airline Services Handling Ltd. Airline Services Handling is the largest independent aircraft de-icing business in the UK. They provide de-icing services at 12 UK airports, operating over 70 de-icing rigs with a team of over 300 fully trained and experienced staff. They currently provide de-icing cover and support for over 240 aircraft flying to and from the UK each morning with typically more than 12,000 events in a winter season. The de-icer tank supply and installation was specified and project managed by Martin Sixsmith of Air Consultancy, a specialist in aircraft ground de-icing services with 30 years’ experience in the industry. Air Consultancy and Tuffa UK have collaborated on a number of projects, with Tuffa having over 30 years’ experience in tank design and manufacture and a track record of supplying most of the UK’s airports. Tuffa de-icer tanks interlinked to increase capacity, with five of the large 15,000 litre tanks holding the neat de-icing fluid, and two 15,000 litre tanks used to store pre-mix fluid. The 7 de-icer tanks were manufactured from Polyethylene, a substance compatible with de-icer chemicals for prolonged usage and durability. 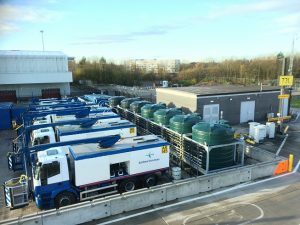 They are interlinked to increase capacity, with five of the large 15,000 litre tanks holding the neat de-icing fluid, and two 15,000 litre tanks used to store pre-mix fluid processed in the modular plant. The total storage capacity of the system including pre-mixed fluid is 140,000 litres. At Manchester Airport, Airline Services Handling is the largest provider of aircraft deicing which is carried out in cold weather conditions prior to departure. This is a safety-critical service. The new layout of the tanks and plant has enabled the company to meet demand due to the rapid expansion of flights out of Manchester. The new system was further enhanced when Airline Services Handling Managing Director, Nigel Daniel, approved the addition of two brand new de-icing rigs from the Airport Ground Support Equipment manufacturer, Mallaghan, based in Dungannon, Northern Ireland. ‘It was great to see all British manufactured products from Tuffa and Mallaghan being used on this project, together with de-icing fluid manufactured in the UK by the Haltwhistle based Chemical manufacturer, Kilfrost,” said Nigel. Tuffa helps Manchester Terminal 2 prepare for take-off! A further benefit of the Tuffa de-icer tanks is that they are portable once drained and can be lifted using a flatbed vehicle fitted with a Hiab type crane. Air Consultancy’s Martin Sixsmith explained further. “The ability to lift and relocate the de-icer tanks within their structural frame work and base was particularly useful,” he said. 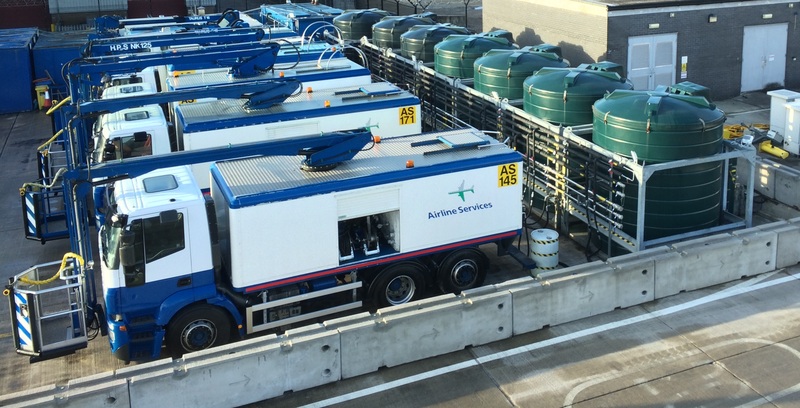 “We drained and re-located the entire series of 7 de-icer tanks for Airline Services when the existing deicer site had to be relocated due to the construction works for the expansion of Terminal 2. Despite the space restrictions of the new site typical of an airport compound, the design of the Tuffa de-icer tanks allows them to be positioned within a small footprint ready to supply the rigs. The Tuffa de-icer tanks helped to make sure that Manchester was ready for take-off for winter 2017/18,” he added. You can find out more the Tuffa de-icer tanks here. Please call our sales team on 01889 567700 or click here for all price enquiries and technical specification.